In today's marketplace, there is no shortage of "consultants" willing to share their advice for a fee. But when it comesto your worker's safety, there are a few things you should know about him or her before you write them a check. Whether you need help with ISNetworld® compliance or a more complex safety management system implementation, this list will help you make sure you choose an effective consultant. Academic qualifications are important and, as a result, degree programs in safety have become more prevalent in the last decade. But just because your prospective consultant has a degree in safety doesn't mean they are a good fit for your company. Of greater relevance is "real-world" experience and results. Look for consultants who have both education and experience. This is another potentially confusing area for the average business owner / decision-maker. While some organizations and professional safety designations such as ASSE and CSP are highly reputable and require documented credentials for membership, many are latecomers with questionable standards. Look for certifications that don't just require the candidate to sit through a class or pay an application fee to receive a credential. Look for evidence that the consultant has previously dealt with problems similar to yours through their previous work history. A capable safety consultant can easily transition among many different industries in applying sound principles of safety management. Does their experience indicate satisfactory knowledge of both the technical aspects of safety management as well as the "human" factors? Who are their clients? Are they known to you? Are they established companies? Don't hesitate to ask for contact names and phone numbers for current (and former) clients. Avoid placing undue weight on any single recommendation. Seek a balanced, overall assessment of the previous work. 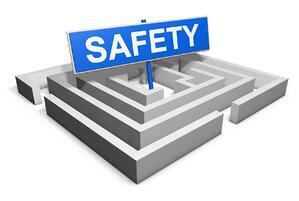 A great indicator of a valuable safety consultant is when a former employer becomes a current client. Will they solve your problem? Certainly, there are never any guarantees. In fact, one should be extremely wary of the safety consultant who "guarantees" that his work will produce a given dollar result. Explain your problem thoroughly and listen closely to the answers. Do the answers appear to match your needs? Do they speak plain English or do they frequently fall into jargon? If you can't understand what they're saying, what good is their advice? Anyone can recite passages from OSHA Standards. The true skill is in understanding and applying them to a client's individual circumstances. A competent consultant will explain safety requirements in everyday language and be able to clearly communicate the ways that compliance can benefit your business. The professional safety consultant cares enough about his business (and the client's) to protect it with, at a minimum, $1,000,000 of professional liability and $1,000,000 of general liability coverage. He will willingly produce certificates of insurance as evidence of this. Please note that legitimate certificates are sent directly from the insurance carrier to the client, NOT provided by the consultant. Anyone with a copy machine and a bottle of "white-out" can phony-up certificates of insurance.